Following the Revlon Lip Butter craze they're launching the NEW Just Bitten Kissable balm stains*. They're a lip stain, which is great because not everyone has time to keep re-applying their lipsticks. When I first saw these yes I did think Clinique Chubby Sticks but was totally smitten by the vibrant packaging. I know these are going to compared to the Chubby Sticks so I wanted to put my two pennies worth in and tell you what I think. These are totally different formulation wise, remember the old saying 'don't judge a book by it's cover'? The pro is the price without a doubt, these will set you back £7.99 each which is great! However the Clinique Chubby sticks are double, setting you back £16 each. Now for the con these are no way as moisturising as the Clinique Chubby sticks. Plus they don't smell as luscious as them either. They have a not so nice 'minty' aroma, which I've become to like thanks to the Caudalie Beauty Elixir. So if you dislike mint scented products you may want to give these a miss. Once they've been applied on the lips you can't smell or taste the mint so that's fine with me I can live with that. I have dry lips all year round and rely on lip balms. So I've been using a lip balm first on my lips to soften and hydrate them and then using the Just Bitten Kissables over the top. I think you also have to take into consideration these are balm stains, which in my mind stain your lips and dry to a matte/satin finish. Where as the Chubby Sticks are a lip balm and lipstick in one. Does that make sense? 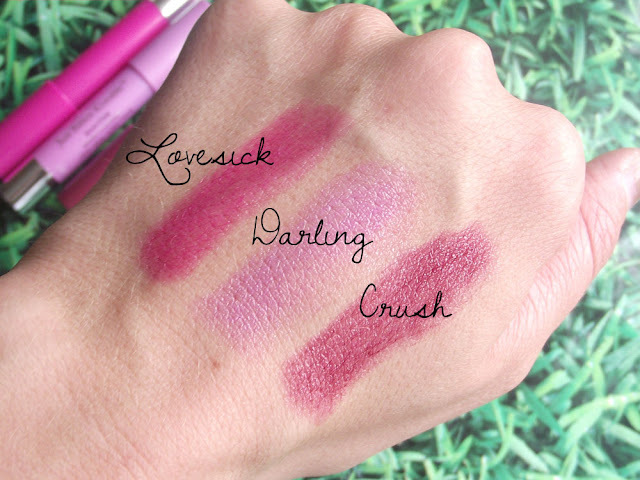 Out of all three shades swatched above I would say Darling and Lovesick are my favourite for this time of year, mind you the way the British weather is right now you might as well pack away your suncream. I think I would wear Crush in the evening, these also work great as a base if you team them up similar lip shades. The colours are beautiful and I intend on trying some other shades once they're available in my local Boots. I can't wait to see the other shades, there's 12 different shades in total. Overall I think these are certainly worth £7.99 and think they will fly off the shelves. What do you think? Will you be trying the New Revlon Just Bitten Kissable balm stains? Oh wow, I can't wait for these! Ooh, darling looks lush, I actually really like a light pink stain as opposed to a bright one, if that makes sense! These are about half the price of Chubby sticks and I've been really impressed with Revlon lately so yes I'mn all over these!